When we received the pictures I thought they were beautiful prints. They are not painted but but stamped/printed on canvas. They can be hung separately or together. We will hang them together on a small wall in family room. The frames are good quality. Love these pictures and bought two sets. The colors are beautiful and go perfect with my gray and turquoise/teal decorating scheme. The reason for the 4 stars is that I needed to hang them diagonally and there was not a hanger in the corner so I had to take them to the framing shop and have them install a wire hanger. Otherwise, they’re beautiful pictures. Bright and uplifting and a generic pattern. 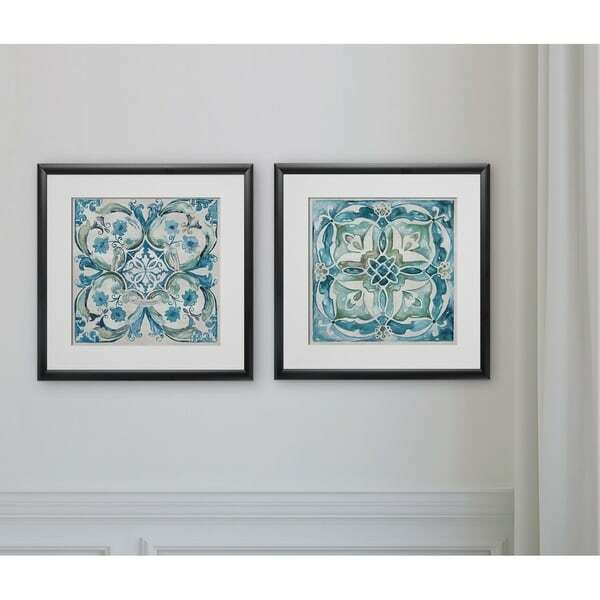 Clean and crisp - these went up in my guest room and the prints mirror a pattern on the quilt I also bought from Overstock. Great value for the price!